Have you ever needed to check which OpenGL version you’re running? Ever need to see which OpenGL extensions are supported by your card and/or video driver? Well, look no further! This post has the answers along with how to get some very useful information about your video driver. I’ve used this program forever on many different cards / configurations and it’s never failed. Not only will it give you information on what OpenGL version you’re running, it can also give you information on the generic software emulation driver. 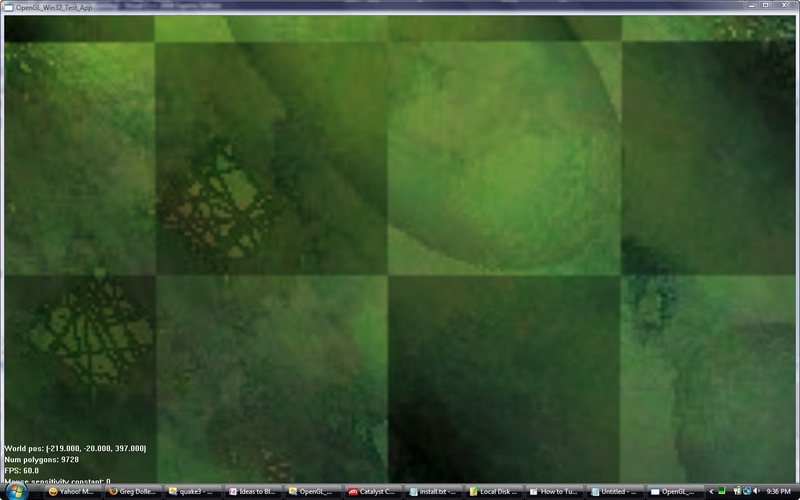 The first tab shows you some system information and a list of all OpenGL versions. For each version it shows how many functions are supported by your card’s driver. Look for the highest version number with “100%” support that also has “100%” marked for all versions prior to it. Whichever version you found was greatest is the actual OpenGL version installed on your machine. It’s possible to have “gaps” in your OpenGL support where the driver doesn’t implement all the functions of one version but does implement everything in a higher version. For drivers written by ATI and Nvidia, this would be very unlikely. In fact, I don’t see any reason it would happen. However, for third-party drivers, it’s definitely possible. 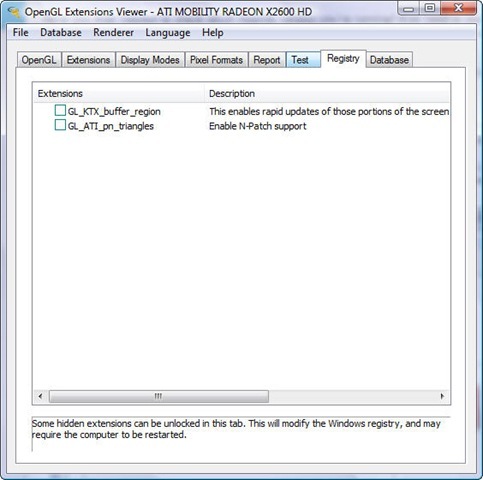 See one of my previous articles: Certain Notebook ATI Video Card Drivers Not Supporting OpenGL 2.0. The next three tabs are pretty self-explanatory. “Display Modes” lists all the different video modes your card supports. “Pixel formats” shows the available pixel formats you can choose when programming with OpenGL. “Report” allows you to print out some of the pertinent information you’ve seen in the other tabs. This tab lists experimental OpenGL extensions that are turned off by default. Use this tab to turn them back on. Beware, these extensions are turned off for a reason – use them at your own risk! 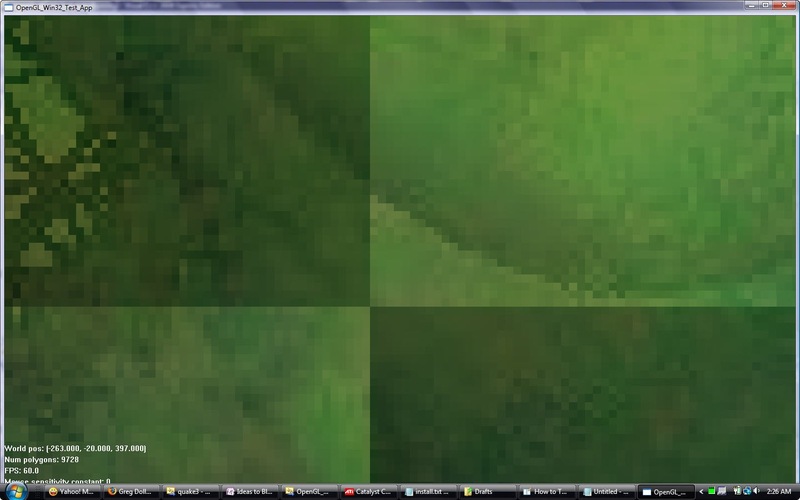 The last part you should check out is the “Renderer” menu option. This menu lists the OpenGL driver(s) installed on your machine. It should show two options, 1) “GDI Generic” and 2) the name of your video card and/or driver. If it only shows “GDI Generic” then something is wrong with your driver installation. “OpenGL Generic” is Microsoft’s generic software emulation driver. It’s only used when no real OpenGL driver is installed on a system. Let me guess, you got here because you’re trying to find an updated driver for a notebook containing an ATI video card? Are you trying to find a driver that supports OpenGL 2.0? 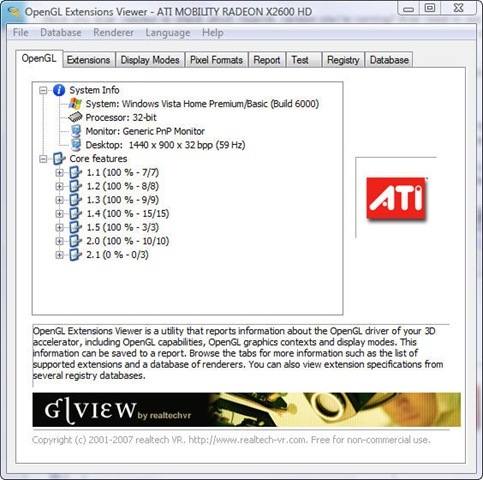 If you were like me — spent a chunk of change on a nice new laptop with an awesome video card, only to find that the driver only supported OpenGL 1.0 (or some version below 1.4) — then you were probably shocked to find that ATI, at the time of this writing, only released Mobility drivers up to the X1800 card. 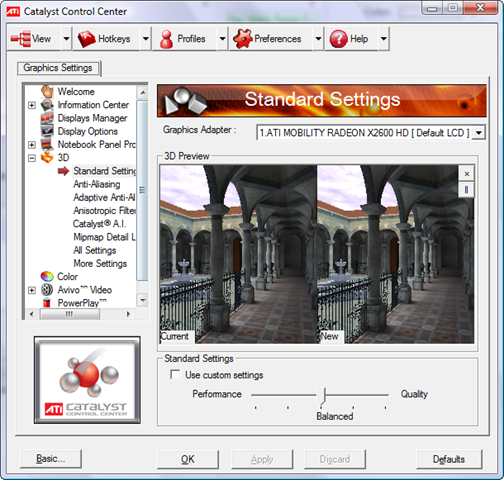 I have the ATI Mobility Radeon 2600 HD running on a Fujitsu N6460 and as you can imagine I was expecting full OpenGL 2.0 support when I bought it (after all, that’s what ATI advertises for this card), but nope, instead I was stuck with only OpenGL 1.0 fully supported and some functions of v1.1 supported. Needless to say, after the discovery of poor OpenGL support, I began searching ATI’s site for an updated driver — there was none. I searched forums, blogs, etc. for an updated driver written by ATI (third party drivers would have been my last resort), but still couldn’t find one. After searching what seemed to be the entire Internet, I found the solution. But first, let me give you a little background on why there are no updated ATI drivers out there. OK, enough history. So what’s the solution? 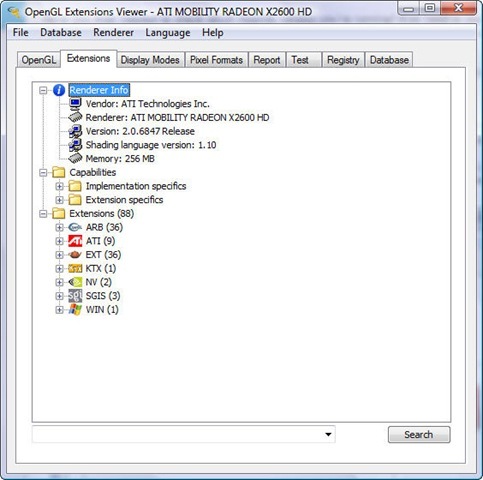 Easy, you need to download the desktop version of the driver for the card that is in your laptop (so for a Mobility Radeon 2600 HD, you would use the Radeon 2600 HD Series), run a program called Mobility Modder which modifies the desktop driver install files so they work with a notebook, and then simply run the modified setup. This version of the setup runs like any other driver install. When done you’ll have all the desktop driver features running on your laptop! You can get Mobility Modder and detailed installation instructions here: http://www.driverheaven.net/modtool/. This program worked like a miracle for me! It saved me from returning my notebook (why would you buy a “gaming” laptop when almost all the games you play use OpenGL and now you can’t play them?). I really like Fujitsu notebooks in all respects, but the fact that they wrote what I believe to be an incomplete video driver and then have the audacity to release it as a “gaming” laptop is just beyond my comprehension. More than half the popular games out there use OpenGL, not Direct 3D! How can it be a gaming laptop if half the games won’t even run properly?! Most will run but will buckle down to using the software-rendered MCD driver for all OpenGL calls not supported by the ICD — an ICD (Installable Client Driver) is the regular driver written for the video card (DOOM 3 looks very “interesting” running in almost 100% software mode). What were they thinking?! This is my third Fujitsu notebook and the two others I’ve owned supported the latest version of OpenGL that was available at the time of manufacturing. Why didn’t they do the same thing with the N6460 model?!?!?! Ugh! I don’t know why it displays the card as being an X2600 (it should be the regular 2600), but hey, everything works perfectly so I’m not worrying about it. Anyway, I hope this article has saved you from pulling your hair out and I hope the solution works for you too.